Working out indoors becomes a necessity for many during the winter months when snow covers the ground, or when other weather conditions make it tough to get outside to exercise. However, you can get an effective workout from the comfort of your home using a few of the most effective pieces of gym equipment available today. One of the best cardiovascular exercises is simply walking, jogging or running. Treadmills allow you to do any of these three workouts indoors. 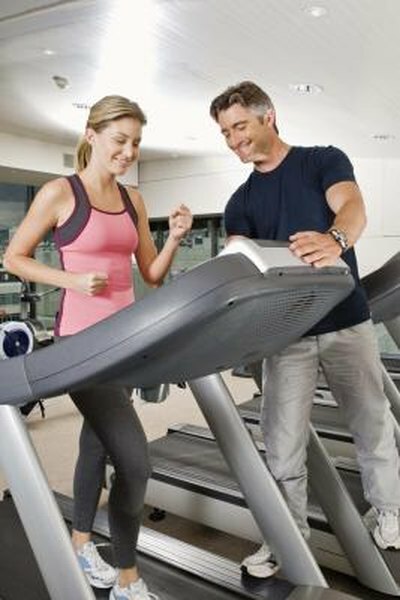 Most treadmills offer built-in programs for keeping your workouts fresh and new, as well as adjustable inclines for increased intensity and calorie burn potential. In addition to improving your overall heart health, treadmills can help you burn a significant number of calories per workout. According to the Mayo Clinic, a 160-lb. person can burn nearly 600 calories per hour jogging at 5 mph. Sometimes referred to as stationary bikes, exercise bikes come in two different formats: recumbent bikes and uprights. Upright exercise bikes simulate the feeling of riding a traditional bike, while recumbent bikes place you in a more comfortable seated position ideal for people with lower back problems. Exercise bikes offer similar cardio and calorie-burning benefits that treadmills offer, but with the added benefit of being a low-impact workout that’s easier on your joints. Many different types of multi-gyms are on the market today, which you choose will depend on your budget and how much space you have in your home for the equipment. This type of exercise equipment allows you to get a full-body workout from a single machine. The Centers for Disease Control and Prevention recommends that adults engage in any sort of resistance training at least twice per week; a multi-gym machine offers everything you need to meet these guidelines. Sometimes referred to as a fitness ball or stability ball, this relatively simple and inexpensive fitness tool opens up hundreds of new exercise routines you can use to target each part of your body. For example, you can use an exercise ball to do wall squats, crunches, leg lifts, oblique training, modified pushups and back extensions. This piece of gym equipment is especially useful for strengthening your core muscles, including your abs and lower back.